Georgia Southern University has chosen its 2016 Southern Orientation, Advisement, and Registration (SOAR) Team. SOAR Leaders help orient new students and their families to Georgia Southern during the summer SOAR sessions by serving as role models for new students, helping them register for classes, preparing them for college level academics and informing parents about the University’s services. Out of 122 students who applied for the coveted SOAR Leader position, 25 were selected based on their leadership potential, work ethic and ability to represent the University. Three students are returning for their second year as SOAR Leaders: Courtney Dyer, a senior psychology major from Dahlonega, Georgia; Abbey LaMee, a junior child and family development/therapeutic recreation major from Acworth, Georgia; and Tyler Wilson, a senior management major from Adrian, Georgia. 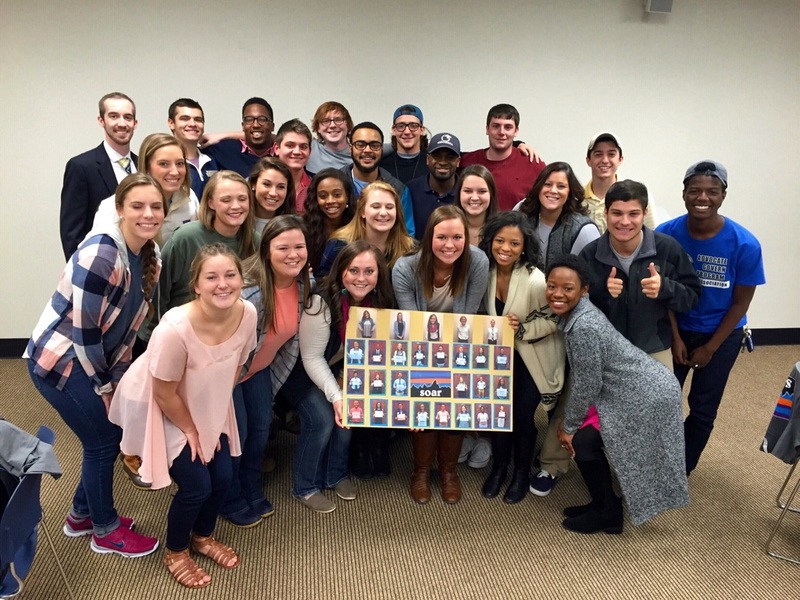 These students helped select the 2016 SOAR Team, which represents more than 25 campus organizations, by trying to find the best individuals to represent the Georgia Southern student body. The juniors represented on the team are Doug Flott, a pre-business major from Brooklet, Georgia; Nick Hartney, an information technology major from Marietta, Georgia; Alec Joiner, a marketing/retail management major from Cordele, Georgia; Sydney Jordan, a pre-business major from Gray, Georgia; Marcus Joyner, an information technology major from Evans, Georgia; Megan King, an early childhood education major from Roswell, Georgia; Courtney Rorex, a journalism major from Austell, Georgia; Crystele Seya, a pre-business major from Lithonia, Georgia; Matthew Windham, a chemistry major from Cordele, Georgia; and Kiera Zellerer, a marketing major from Savannah, Georgia. Sophomores who were selected include Brandon Ashiedu, a mechanical engineering major from Douglasville, Georgia; Chandler Avery, a mechanical engineering major from Hoschton, Georgia; Josh Bailey, a chemistry major from Waycross, Georgia; Savannah Freeman, a pre-business major from Woodstock, Georgia; Charabele Louis-Jacques, a biology major from McDonough, Georgia; Daniel Marin, an international trade major from Woodstock, Georgia; Alexa Rushworth, a public relations major from Atlanta, Georgia; Kat Shuman, an English major from Reidsville, Georgia; Danielle Souza, a biology major from Londonderry, New Hampshire; and Emily Stephens, a pre-business major from Atlanta, Georgia. Freshmen selected include Moses Malloy, a mathematics major from Richmond Hill, Georgia, and Devin Thornton, a pre-business major from Lithonia, Georgia.